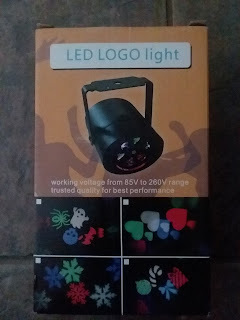 I got to test out the LUCKDAYL Birthday Party Lights LED Landscape Projector Rotating Rgb Logo Stage Holiday Lighting Indoor for Holiday Birthday Wedding Party on Amazon. 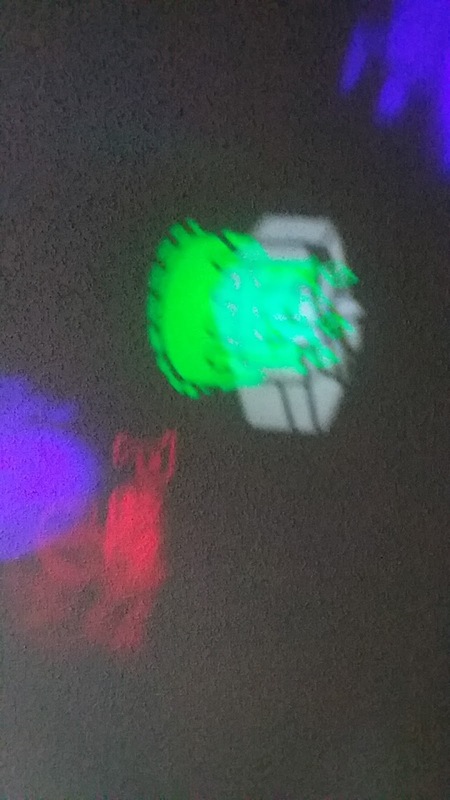 This light is super cool! 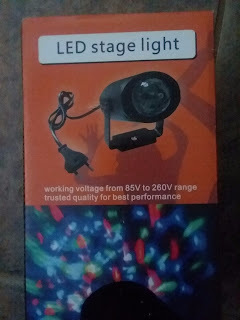 It is not like the Christmas ones almost every other house had up during the holiday, this light comes with 6 faces, something for every occasion. I got this on a day it finally decided to rain so I wasn't able to take it outside and play with it but I did however try it in my house. We waited until it got dark out to enjoy the fun, first we tried out the hearts because well they were the ones which were inside when we received it. The hearts can work with so many themes, like asking your friend to prom, asking someone to marry you, celebrating a anniversary, something cheesy like my last name, and many other possibilities. 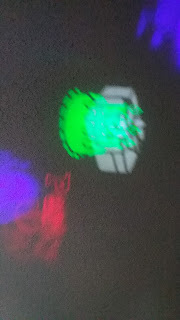 Next was a Halloween like disk that has a skull, bats, ghost and spider. 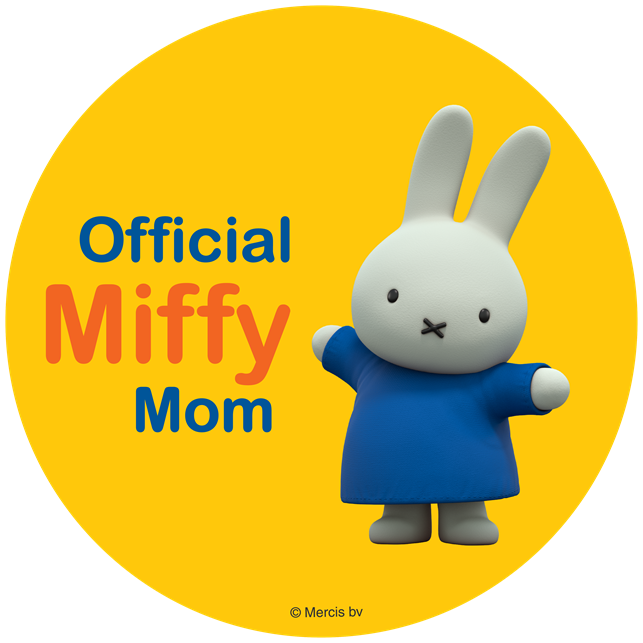 Although this would be good for Halloween it would also make for the perfect pirate party idea, as well as just a boys or tomboys party. The Christmas card shows a candy cane, bow, present and ornament. Which yeah this one probably is best for the Christmas spirit. The last 3 disk, the one is for a birthday party which spins a boy with a present, a birthday cake, a present on its own and the words party girl. Which I am not sure why they had party girl because well it kinda makes a boys birthday seem a bit odd to have the words party girl go across the home? But hey one out of 6 is not bad. Then there is a disk has cupid's arrow, wedding with a rose, kissing and 2 hearts, which again can be used like the hearts one except for the wedding part that might send your prom date running :) Finally the last disk is the snow flakes which for me in FL is the closest thing to snow I will get, so this one is a big deal. My poor kids haven't even really seen snow, shish I haven't really seen snow, so it is a nice relaxing flow of 4 snow flakes. 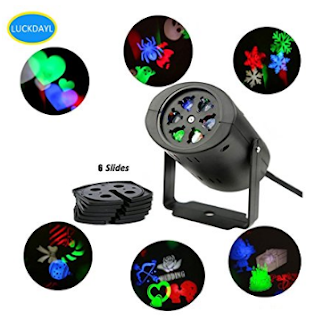 The LUCKDAYL Birthday Party Lights LED Landscape Projector Rotating Rgb Logo Stage Holiday Lighting Indoor for Holiday Birthday Wedding Party is super easy to use, simply plug in and slide a disk in. It reminds me of a viewmaster only instead of clicking for the next pic it automatically does it for you. 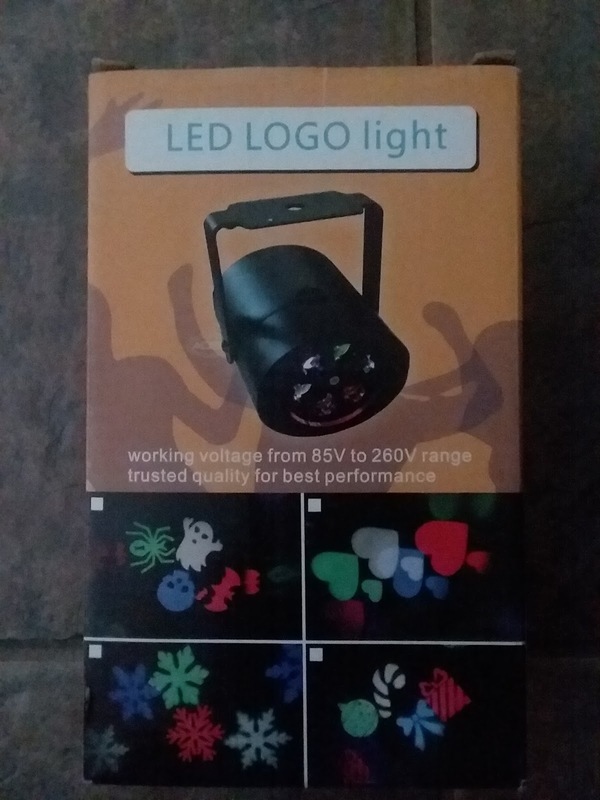 I really enjoy my new light and can't wait for the holiday's to start coming so I can impress my neighbors with a fun light show. The only cons I had are that there is no on off switch you have to unplug it to turn it off but then all these types of lights seem to be this way, so it's not really on them. The other con I had was that the cord was short, but that can be fixed with a extension cord. I also will say that what is nice about this model is that the cord is a two prong not a 3 so you have more options to plug it into then the 3 prong ones. Last con is it did not come with a yardstick but it does have a hole ready for one, which you can always use a pencil if you really wanted. You can purchase the LUCKDAYL Birthday Party Lights LED Landscape Projector Rotating Rgb Logo Stage Holiday Lighting Indoor for Holiday Birthday Wedding Party on Amazon.